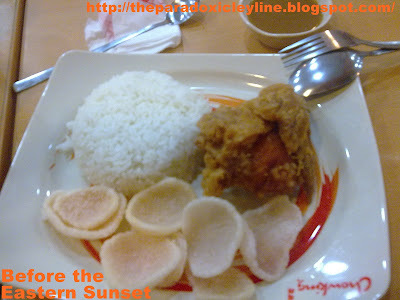 I just tasted the new item on Chowking menu, which is the Chinese-style chicken. Now, I can say that the TV commercial about it is exaggerated. A TV ad said that many people are lining up just to taste the Chinese-style fried chicken. Another ad had the people praising Chowking's chicken to high heavens, as if it is the best tasting chicken ever created. The Chowking TV ads, like the usual advertisements, are exaggerated. One reason is that I am yet to see a Chowking branch that has hordes of people are lining up just to taste the Chinese-style chicken. Due to curiosity, I ordered the rice meal with one piece Chinese-style chicken during my last visit to Chowking. The rice and chicken is accompanied with some pieces of fish crackers. This Chowking menu meal set costs 69 pesos. I don't agree that Chowking’s Chinese-style chicken is the best but I can say that it is better than the fried chicken available from other fast food restaurants like McDonalds and Jollibee. My favorite part of fried chicken is the skin, which I usually gobble up first. I like the fried chicken skin’s salty flavor and its crunchiness. Another thing that I like is that the breading, if there’s any, is thin. This is a far cry from the fried chicken of other fast food restaurants that makes feel that I am eating fried breading instead of the fried chicken skin. I can’t praise this new item in the Chowking menu like the way it is being praised in TV commercials. What I can only say is if I am ask to choose between the fried chicken of McDonalds, Jollibee and Chowking then I will choose the Chinese-style chicken of Chowking. Visit Ahab Reviews and Tips and read about the 2011 Korea Electronics Show. nagulat naman ako sa ad ng chowking na ito bakit ngayon lang ba sila nagkaroon ng chinese style chicken american ba ang chowking? ganon pa man mukhang effective ang bagong ads. ang mahalaga nagustuhan ng masa at nagustuhan mo compere sa mcdo orjollibee. Yes. Chowking is too fast food. Also, no fast food restaurant can defeat a proper Chinese restaurants in serving Chinese cuisine. He he...baka maliit ang manok ng mga Intsik kaya maliit yung chicken ng Chowking. Yup. Ngayon lang sila nagkaroon ng Chinese-style chicken. Kaya nga todo promote sila eh. I think nagsawa na yung mga tao sa manok sa McDo at Jollibee kaya gusto naman nilang subukan yung bago ng Chowking. Matitikman niyo rin ito. Kung may Jollibee na d'yan eh malamang na sumunod na din yunf Chowking or Greenwich. Isa lang ibig sabihin kapag maraming ipis. Pabaya yung manager at yung crew ng restauraant na iyon. Malamang naging kahihiyan na yung branch na iyon kaya isinara na. Ako ang paborito ko yung noodles nila.